The forecast for summer vacation in Colorado calls for big blue skies in the day and cool evenings at any altitude. Claim your share of our mild weather by getting outside and exploring every corner of the state, where there's no end of summer things to do. 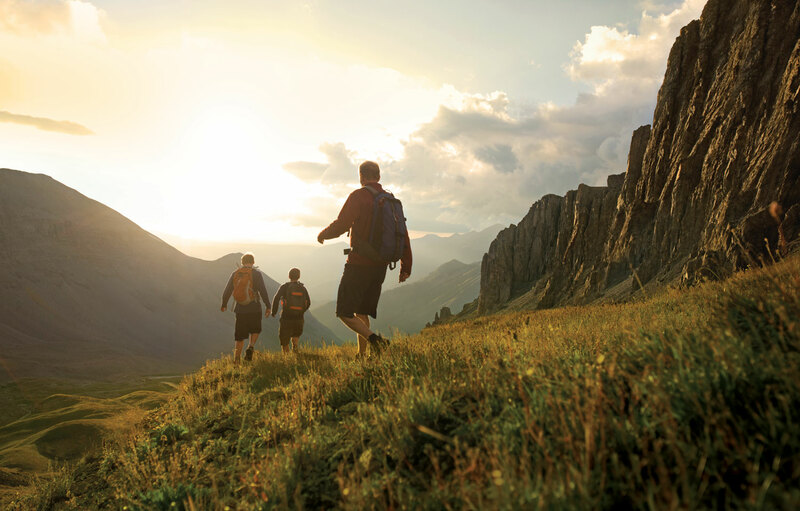 Whether your goal is “Summit or Bust” up the steep side of a fourteener or more of a lazy creekside amble, Colorado has hundreds of miles of trails that are just your speed. Not only are they easy to access, but the catalog of available hiking experiences is incredibly diverse — paths through wildflower-strewn meadows, treks amid cliffs and canyons to petroglyphs left by ancient people, journeys through swaying grasslands that haven’t changed since pioneers first set foot there hundreds of years ago, walks that lead to rushing waterfalls and so many more. In Colorado, bicycle riding is not just a way to get around before you get your drivers license: it’s a way of life. From the state that invented mountain biking (Crested Butte claims that honor) and has dozens of endurance and high-altitude road biking races each year (including several where you ride for 24 hours straight), you can bet there’s an abundance of bike trails. There are also hundreds of miles of paved, flat trails for the more casual pedaler, as well as outfitters across the state that can provide all the gear needed for a two-wheel outing. One of the most unique facets of Colorado’s bike culture is that every spring, many ski areas become mountain-biking courses for every skill level. Riders take their bikes up the mountain on gondolas and then wind their way down slopes reserved for skiers in winter. If you hear someone bragging about how far he hit the ball on a recent golf vacation, you might ask where he was when he experienced this feat. Chances are, it was in Colorado. At high altitude, where the air is thin and dry, everyone’s ball flies farther and straighter. This feature is likely one of the reasons so many golfers are drawn to the state. Add year-round play — you can even go from the ski slopes to the green in one day in some locations — and only-in-Colorado backdrops, and you’ll discover plenty of other reasons, too. Several companies offer packaged golf tours that allow you to sample several different layouts around the state. Dramatic scenic backdrops, endless trails and a history of horseback riding make Colorado a perfect destination for equestrian immersion. Each region offers a different landscape for horseback riding and any level of horsemanship. Guided trail rides are best for beginners. Knowledgeable wranglers lead small groups, pointing out wildlife and points of interest. Pack trips, where guides accompany you from one campsite to the next as you head farther into the backcountry, are good for more seasoned riders. And dude ranches offer something for every level of rider and include weeklong stays, great food, tailored riding instruction, kids’ programs and cattle gathering for a complete Wild West experience. The headwaters of four major rivers begin in Colorado — the Colorado, Platte, Arkansas and Rio Grande — and every spring, whitewater lovers flock here with their kayaks strapped to the roofs of their cars. The season typically runs from May through September, with the swiftest whitewater occurring in May and June. August is the best month for a more laid-back outing. The state’s abundance of outfitters, paddle parks, placid lakes, mellow rivers and challenging rapids make it the ideal place to learn to kayak and raft — and perfect your paddle on more formidable waterways. Cave of the Winds in Manitou Springs grants access to more than two miles of limestone passageways. Well-lit, easy tours explore the cave’s twists and turns. For those who want to peek into its haunting depths, they’ll turn out the lights and you can explore by lantern light. Reached via gondola ride with views of the Roaring Fork Valley, Glenwood Caverns in Glenwood Springs has wide-open, massive rooms lined with otherworldly rock formations. If you’re feeling like you’ve got the hang of this caving thing, there are also tours of undeveloped portions of the caverns that include some crawling and squeezing to get into. For experienced cavers, there are also several undeveloped caves, including those at Rifle Falls State Park and Dinosaur National Monument and many in the White River National Forest. Visitors to these caves must remember that they can be dangerous, and proper equipment is needed for a safe trip. Find 5 Things to Do Before Summer's Over, Colorado Family Attractions for Summer and 12 Quintessential Summer Festivals in Colorado and the Colorado Outdoor Adventure Blog.